Directions – Sycamore Speedway : Midwest's Best Clay Track! 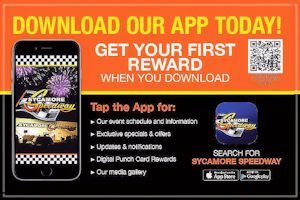 Sycamore Speedway is located approximately 4 miles east of Sycamore IL and 15 miles west of St. Charles IL, on the north side of Route 64. Fans should enter the complex through the main entrance from Route 64. All racers can enter through the competitors entrance west of the track off of McGough Road. If you have not yet registered, you may register when you arrive and pick up your Pit Pass. If you would like to pre register, you can do so by calling (815) 895-5454. On Fridays: Gates open at 6pm, Time Trials at 7:15pm with races to follow. On Saturdays: Gates open at 6pm, Time Trials at 6:30pm with races to follow, Unless otherwise stated. $15 for ages 12 and above. Pits open at 2pm for car pull out. On Saturday Pit Shack opens at 3:30pm. On Friday Pit Shack opens at 5pm.